With pools, helipads, internal and external lounges and stunning sea views, the Admiral X Force 145m manages to balance opulence and a clean, elegant design. See all the pictures of the renderings here. 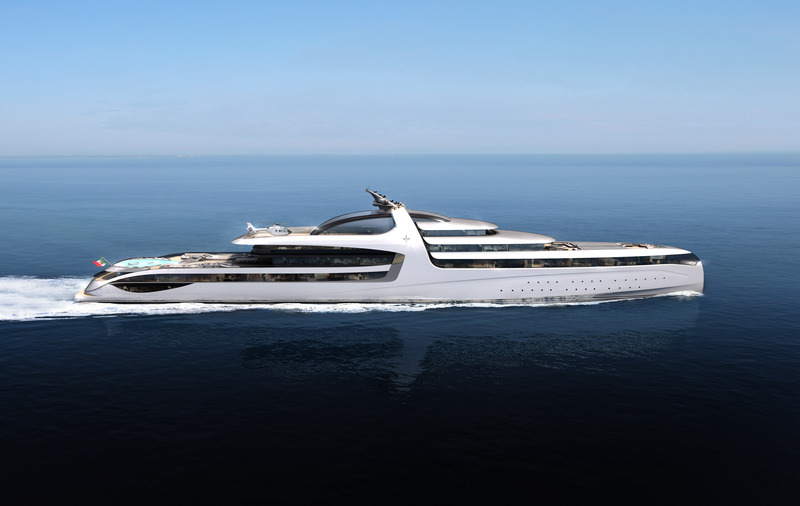 The Italian Sea Group’s ADMIRAL Yachts’ project Admiral X Force 145m: Born from Experience could easily be the most luxurious superyacht we’ve set eyes on. With the huge owner’s quarter on an entire deck and measuring 55 meters in length, a double level main saloon, a grand crystal chandelier and central spiral staircase, two helipads and a hangar, toys and cars, two cinemas, two swimming pools, a SPA, several gyms, enormous sunbathing areas and external lounges, this 145 meters beauty could be one of the most extravagant and expensive yachts ever built. Whilst the interiors are all marble and crystal, Monaco-based design studio Dobroserdov Design have kept the exterior modern, with simple yet effective clean lines which give the craft an overall light and elegant look. Admiral’s trademark glass surface ensures plenty of natural light throughout the ship, from the bow of the yacht – where an exceptional observation lounge has been located – to the stern area, with its double level beach club & SPA complete with both internal and external swimming pools. Interiors and beach club & SPA area have been created by Turin based architect Gian Marco Campanino – GMC Design, and boast curved lines, fluid rounded shapes and a large use of full-height sliding glass walls, in addition to double height spaces, private balconies for all VIP suites, indoor gardens with ponds and majestic fireplaces, should the weather get nippy. 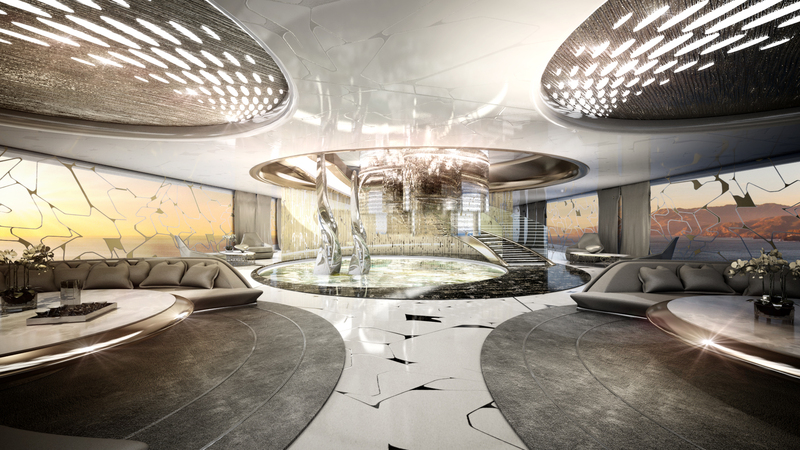 The Admiral X Force 145 black and white lounge with stunning views. So how much will this palace on sea set you back? Whilst the price is only available on request, media reports have speculated that it could cost as much as half a billion pounds. Get Christmas wrapped up. Click here to subscribe to SuperYacht World for only £16.99, a saving of 26%!